Barry lives in Florida, USA and decided to formalise his training in the UK with The English Toastmasters Association. 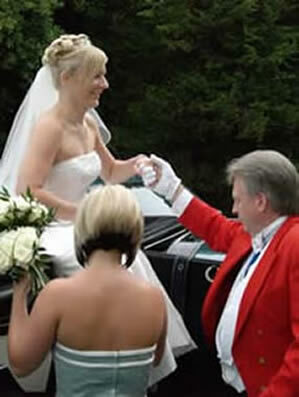 Barry will be pleased to offer you his professional services as your wedding toastmaster or for any type of event or function, as this is a unique service in Florida, Barry will add a touch of English charm to your special day. Barry has worked with the public for most of his working career and has a vast amount experience in protocol and diplomacy. All of this combined means he has a passion to make sure everything is done to your complete satisfaction. Barry is certain to enhance your day and fulfil all of your requirements which will make your special day extra special!! Listed below are the three founder members of The English Toastmasters Association. You are welcome to contact any of our toastmasters directly to hire a toastmaster for your wedding or special occasion. A Founder Member of the English Toastmasters Association, Richard who lives in Chelmsford, Essex, England UK offers a great deal more than just Toast mastering... If you want the best reactions from your guests and to be pampered on your special day, Richard is the man for you. 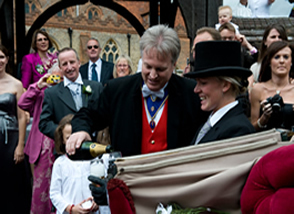 Richard is a highly client focused wedding toastmaster, which means that if you are a bride looking for a toastmaster to make you feel really special on your wedding day, he will be the the right choice for you. A Founder Member of the English Toastmasters Association, and as your wedding toastmaster Russell, has the skills and know-how to work with you to ensure that your function is meticulously planned and executed. Russell lives in Suffolk, England, UK.